Barnes & Noble fired back at the Kindle today with a simple, 6″ touchscreen Nook that has a 2 month battery life and sits at 10% smaller than the Kindle 3. The new ereader also features an E-ink Pearlr display, a soft contoured back and a WiFi connection. This is designed to be a stripped down reader that will compete directly with Amazon’s offerings and sit below the current Nook and the Nook Color in B&N’s lineup. The new ereader runs on Android 2.1 and is powered by an 800Mhz TI OMAP3 processor. Barnes & Noble also announced that the ‘Read in-store’ program has launched, which allows Nook users to read whatever they want on their device in any B&N store. In addition, Barnes & Noble announced Nook friends, which lets you share what you’re reading via Facebook, Twitter and email, as well as LendMe and ePub support. They will also soon launch myNook.com, which is a portal that acts as your custom profile to share and connect with friends. The new Nook will be available for pre-order immediately and is shipping around June 10th. It will be available at B&N locations as well as Best Buy, Walmart and Staples stores. 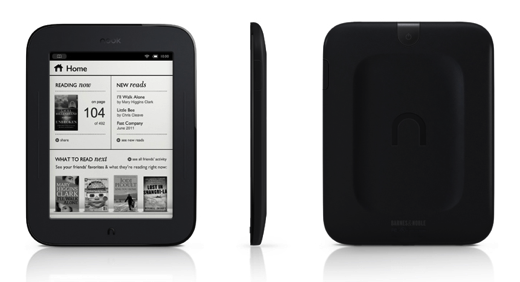 The current Nook will be dropping in price to $119 for the WiFi model and $169 for the 3G model. The older Nook will be available until existing stock is exhausted, at which point it will disappear from the lineup.